Pros: Great value for money. 1080p Full-HD screen. Good connectivity options. Cons: Non-touchscreen. Limited processor performance/storage. Lacks backlit keyboard. Average battery life and sound. In our current technological space where laptops come with so many options and in different shapes and forms, trying to find a dependable laptop at a great price, that will also fit your needs is certainly no easy task. 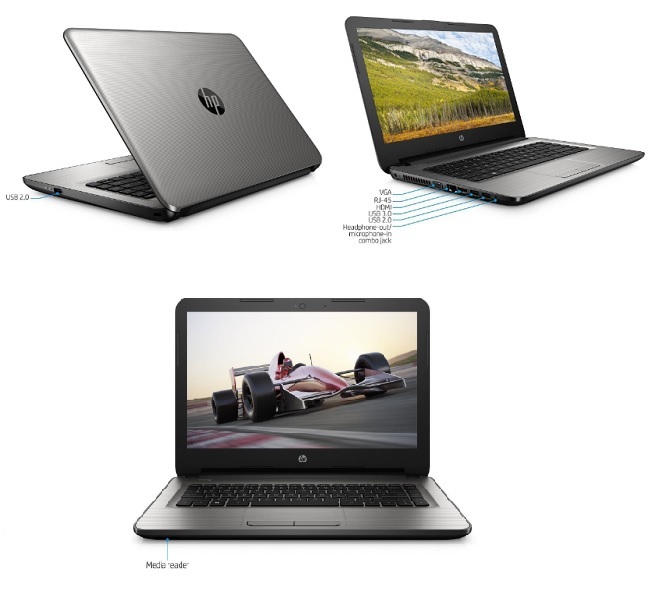 However, if you’re looking for a low priced entry level laptop that offers some good features and specifications, then you might find that HP 14-AN013NR is one of the best choices currently available in the market. This laptop caught our eye because it comes with a Full-HD 14-inch display, Solid State Drive (SSD) and a price tag of under $200 that makes it exceptional value. Additionally, you will get dependable performance over a long period of time with it's latest AMD processor that can perform basic computing tasks quite easily. The performance boost offered by the SSD is definitely a plus. The laptop feels quite sturdy as far as the overall build quality is concerned. The laptop features textured linear grooves with horizontal brushing in silver color to give the laptop a great look that allows it to stand out no matter where you take it. It's silver finish makes it look premium however it is nowhere near ultrabook size/weight, but it is a fairly light laptop and portable enough for students to carry around. * 1.8GHz AMD (E2-7110) Quad-Core Processor. * AMD Radeon R2 Graphics. * 14.0 inch Full HD (1080p) screen. * 1 x USB 3.0, 2 x USB 2.0, 1 x HDMI, 1 x LAN port, 1 VGA port, Memory card reader, and HD camera. Performance - As far as performance goes, the AMD E2-7110 Quad-Core processor is not going to blow your mind, nor is it a processor meant for playing games. However, you do get a very dependable speed if you're only thinking of performing basic tasks like web surfing without too many open tabs, word processing, video playback and light photo editing. For less than $200, you can only expect performance similar to that of a low-end Chromebook like the ASUS Chromebook C202SA-YS02. Benchmarks such as Octane 2.0 confirms our opinion with low scores. The AMD E2-7110 processor is specifically suited for entry-level devices and subnotebooks however it has a very low power consumption which is great for battery life. We would recommend this laptop for college students who need a new laptop that works well. Storage & Memory - When you go to buy a computer whether it’s a desktop or a laptop, one of the most important things to keep in mind is making sure that you give yourself plenty of storage and memory so you can efficiently run all the tasks you want and store all of your desired files. With this particular laptop, you only get 32GB eMMC style SSD storage. However, this type of storage is considerably faster than a mechanical hard drive which offers great performance boost while booting and reading/writing to the drive. You can typically expect this laptop to boot from being completely off, to displaying a fully loaded web page in as little as 30 seconds. Also, thankfully the HP 14-AN013NR comes with an SD card slot so you can expand the storage to 128GB by buying a high speed memory card such as the PNY Elite Performance 128GB High Speed SDXC Class 10 if you like. Alternately, you can expand the storage via external HDD like the Seagate Expansion 1TB (STEA1000400) portable external drive or use a cloud storage solution such as Amazon Drive which includes unlimited storage for photos if you have an Amazon Prime membership. As mentioned, we would recommend this laptop for students as we think the 4GB of memory is sufficient for them to complete their school/college tasks. The memory is suited for minor multitasking only. If you really wanted to, you could upgrade the memory up to 16 GB. This does require you to open up the laptop however. Also, please note that if you do upgrade then the operating system will recduce the SSD space by an equivalent amount which is already very limited. Display, Graphics & Sound - While this laptop isn’t going to be the type of laptop that you use for high-intensity gaming or graphic design work, it is still pretty important to pay attention to details such as the display, graphics and the overall sound quality. In terms of the display, the laptop features almost a full sized 14 inch IPS (In Plane Switching) screen with Full HD (1920x1080 pixels) resolution. It is however, non-touchscreen display. Again we think having a Full-HD laptop for this price is a pretty good deal. The screen is glossy and has lots of reflection and glare. Overall, images are pretty sharp with good viewing angles but brightness is a little low, in our opinion. Looking at the graphics aspects of this particular laptop, we couldn't find some precise details. However, one thing we can say for certain is that the integrated AMD Radeon R2 Graphics card is not at all suited for playing demanding games. Only very light games such as 'Angry Birds' or 'Candy Crush' or some flash games will work fine. Lastly, if sound is going to be important, you probably will be disappointed. The sound often crackles and there is not much volume. Battery - Even though the processor is power efficient the lithium ion battery (HP HS03 11.1V/31Wh 3-cell battery) delivers a battery life of only about 4 hours. It is definitely not an all-day laptop. While we already discussed some of the features of the laptop above, there are still others that are worth your consideration. Finding a laptop with some of these extra options can help make sure you can get the most out of your laptop. The laptop offers Wi-Fi capability and Bluetooth technology. The WiFi features 802.11ac WLAN. This means that you will have no problem hooking up your laptop to a lot of the already existing technology that you use. Other connectivity options includes a HDMI port, 2 x USB 2.0 ports, 1 x USB 3.0 port, VGA slot and a media card reader. This laptop comes with a front facing HD camera that works well in low light, which makes it the perfect choice for anyone that may consider using the laptop for video calls with their friends. The chiclet keyboard is pretty decent to type on and there is almost no flex in the keyboard even though the body is made of plastic. It is however not backlit. The touchpad seems to be quick and responsive. The laptop also features Snapfish, which is a convenient service that allows you to store all of your photos in one place so they can be accessed from one place. No matter what device you are on, you will have access to your photos. Furthermore, HP Support Assistant is included with the purchase of every HP laptop you buy so that you know you won’t have to worry about getting help for your PC. Whenever you need help, there will be an HP assistant ready and willing to take your call and ensure that your laptop is up and running normally. Also, one thing to note is that there weren’t many junk applications pre-installed on the laptop, which is pleasantly surprising. Usually laptops come with loads of trial software which users hardly run. In terms of weight, the laptop weighs in at just under 4 pounds, so while it isn’t incredibly light, it’s also not super heavy or bulky. Overall measurements of the laptop is 13.6 inches x 9.51 inches x 0.94 inches. Arguably the biggest selling point of the HP 14-AN013NR is it's price. We review a lot of laptops but haven't come across a laptop for less than $200 that offers great features as well. It is like a low priced Chromebook but offers plenty of features that you'll usually find in a bit pricier laptops such as a Full-HD screen and SSD storage albeit limited. School/college students will definitely appreciate the Full-HD screen for multi-tasking, writing assignments, reading and watching videos/movies. Although the laptop's performance is limited to very basic tasks, it has good connectivity options like USB 3.0, HDMI, VGA display, LAN port plus excellent Wi-Fi and Bluetooth. 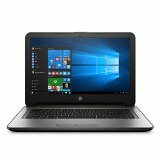 If you are a casual home user/student and mainly into listening to music, watching videos, doing research/assignments, social media, exchanging pictures, general web browsing, emails, shopping, and playing very basic games, then you are going to find this laptop to work well for the majority of your needs.